Converting fractions to decimals is one of the basic skills in mathematics that you should learn in order to pass the Civil Service Examination. Being able to convert numbers to fractions, decimals, and percents, will give you an advantage to solve problems better and faster. In this post, we are going to discuss how to convert fractions to decimals. 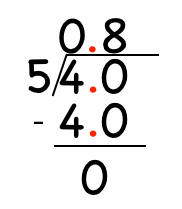 Recall that in fractions, the number at the top of the fraction bar is called the numerator and the number at the bottom of the fraction bar is called the denominator. In converting fractions to decimals we divide: the numerator becomes the dividend and the denominator becomes the divisor (don’t switch!). 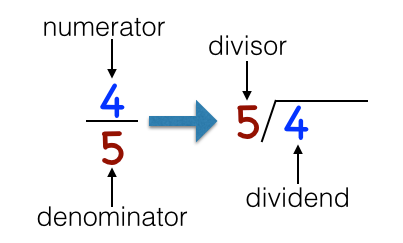 In converting fractions to decimals, you should divide the numerator by the denominator manually. Take note of this step because most solvers switch their places. Example 1: Convert to decimals. First, 4 divided by 5 cannot be done, so we place 0 in the quotient. Second, we add the decimal point and place 0 after the decimal point in the dividend. We also add the decimal point to the quotient aligned with the first decimal point. Third, ignoring the decimal point, we divide 40 by 5, which gives us 8. 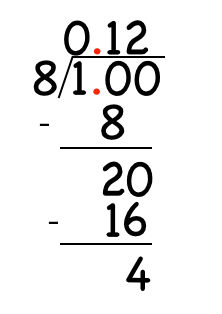 We write 8 at the right of the decimal point and continue our calculation. So, in decimals is . Example 2: Convert to decimals. Again, we align the decimals and divide 1 with 8 which cannot be, so we place 0 in the quotient. Next, we add the decimal point and 0 to the dividend. Now dividing 10 by 8, we get 1 a quotient as shown below. After subtraction, we still have a remainder. So, we add another 0 in the dividend as shown. Performing division, we have the following calculation. Next, we still have a remainder. Adding 0, we have the following calculation. 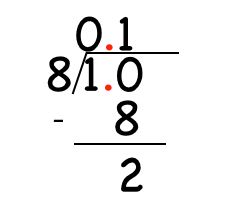 Example 3: There are cases that the decimal in non-terminating such as . If you calculate this fraction, it will give you with never ending 3’s. So, you can just round to 0.33 or depending on the number of decimal places required. Example 4: There are cases that the decimals are repeating. For example, if we convert to fractions, we get 0.142857142857 with 142857 repeating. Again, in examinations, they usually tell you to round your answers to the nearest place values. Example 5: For mixed fractions, you can just ignore the whole number, and then convert the fraction to decimals. After you have calculated the decimal, add the whole number. For example, how do we convert to decimals. First, we ignore the whole number. Then, we convert to decimals which is 0.8 in Example 1. Lastly, we add 9 and 0.8 which is equal to 9.8.